Make your public space and public art even more of a showpiece with an inspired outdoor lighting design by Innovative Nightscapes. An award-winning, professional outdoor lighting design firm in Portland, Oregon, we can expertly facilitate the emotion and mood you want to project and catch the eye of the viewer and provide an alternative to everyday visual chaos. Think of the famous statue of the somber Abraham Lincoln at night sitting bathed in light behind the marble columns of the Lincoln Memorial in Washington, D.C. The lights of the 16th President’s massive Memorial, which is open to the public 24 hours a day, casts an ethereal, golden glow on the waters of the nearby Reflecting Pool. Because of the stunning effect created by the outdoor lighting design, the memorial is photographed more often at night than day. Paul Welty, owner of Innovative Nightscapes is a certified professional outdoor lighting design firm in Portland, Oregon with extensive training in his specialty field. He understands the gravity of such public spaces, as well as the amusing qualities of some public artwork. He works with municipalities, art foundations and artists to illuminate those qualities and help set the proper tone. Innovative Nightscapes has been creating spectacular outdoor scenes through the art of lighting since 2007. Let us shine a light on yours! 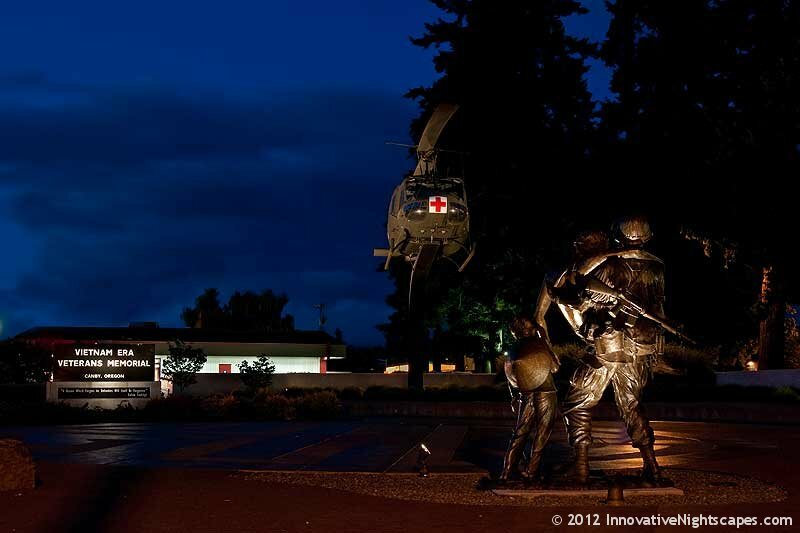 Innovative Nightscapes designed a lighting scheme that would dramatically capture the solemnity of the Vietnam Era Veterans’ Memorial while downplaying its highly commercial location. 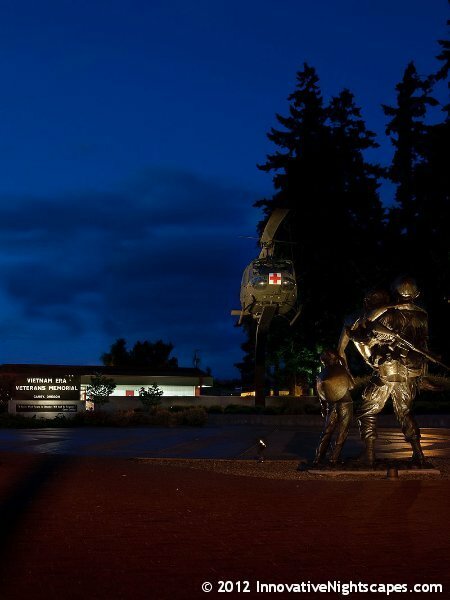 As he does with any project, Paul made several nighttime trips to the Veterans’ site to document the surrounding ambient lighting and devise a way to keep the viewer’s eyes from straying to an adjacent fast-food sign and a nearby strip mall. But the Memorial posed even more challenges than having harshly lit businesses and a busy highway as neighbors. 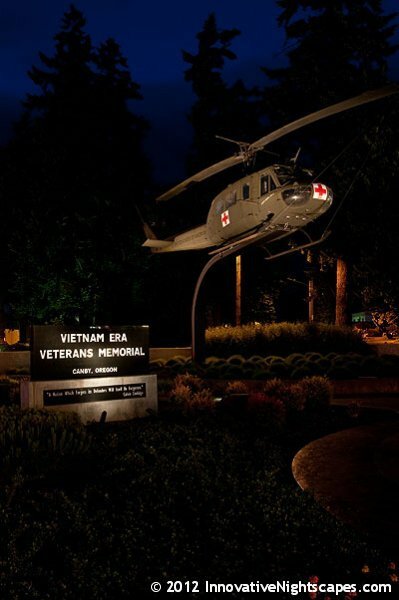 A huge, full-size U.S. Army Huey helicopter held aloft by a steel pedestal is the centerpiece of the Memorial. Paul had to unify the helicopter and, on the other side of a symbolic rice paddy, a bronze statue of a soldier carrying a wounded comrade walking beside a Vietnamese child. Innovative Nightscapes was able to outshine the ambient commercial and street lighting around the space and command the viewer’s attention, helping create a dramatic paean to peace. Innovative Nightscapes offers service and maintenance plans to ensure your lighting investment is looked after as carefully as your public art.